Compared to the NMJ, relatively less work has been done on synaptogenesis in the brain. But recent technological advances such as real-time imaging and transgenic animals have provided some insights into the molecular and cellular processes that underlie the formation of central synapses. An emerging concept is that the multiple steps involved in synapse formation observed in the NMJ also occur in the CNS (Figure 12.3). Early studies using dissociated cultures of hippocampal neurons provided key evidence that neurotrophins play an important role for the formation of both inhibitory and excitatory synapses54. Hippocampal neurons isolated from embryonic day 16 (E16) rats do not generally develop spontaneous synaptic activity, however, treatment with neurotrophins for 3 days elicited a marked increase in the number of functional synapses54. More specifically, BDNF induced formation of both excitatory and inhibitory synapses, whereas NT-3 induced formation of only excitatory synapses. When NT-4 gene was knocked into the BDNF locus, functional synapses as measured by FM dye labeling in cultured hippocampus formed much earlier, compared with those in wild-type mice55. Since NT-4 binds TrkB with similar affinity and that application of BDNF and NT-4 to wild-type cultures elicited similar effects on synapse formation55, it is likely that differential expression (soma versus dendrites or axons) or secretion (constitutive versus regulated) of BDNF and NT-4 may contribute to the differential effects. Do neurotrophins regulate hippocampal synaptogenesis in vivo? In neonatal hippocampus (postnatal day 12-13 in rats) in which endogenous BDNF expression is low, CA1 synapses are unable to express long-term potentiation (LTP), primarily due to the inability of these synapses to follow high-frequency, tetanic stimulation (HFS) commonly used to induce LTP. Application of exogenous BDNF to developing hippocampal slices facilitates LTP by enhancing the CA1 synapses to respond to HFS56,57. These results suggest that BDNF promotes the maturation of hippocampal CA1 synapses. Indeed, in neonatal hippocampi derived from TrkB-/- and TrkC-/- mice, there is a significant decrease in many synaptic proteins and in the total number of synaptic vesicles per nerve terminal, as well as a reduction in the number of synaptic contacts58. Conversely, transgenic mice overexpressing BDNF not only increased the number of both excitatory and inhibitory synapses but also elicited earlier maturation of these synapses59. Using three different lines of conditional knockout mice that deleted TrkB gene in pre- and postsynaptic cells at different developmental stages, Parada and colleagues elegantly demonstrated that TrkB signaling has a cell-autonomous role required for normal development of both presynaptic and postsynaptic components of the Schaffer collateral synapses60. Presynaptically, BDNF-TrkB signaling appears to promote synapse maturation by facilitating synaptic vesicle docking at the active zone. Electron microscopic studies showed that deletion of BDNF gene reduced the number of vesicles docked on the presynaptic membranes of CA1 synapses61. Similar vesicle docking deficit was observed at the parallel fibers to Purkinje cell synapses in the cerebellum of BDNF-/- mice62. Conversely, treatment of neonatal hippocampal slices with BDNF promoted synaptic vesicle docking63,64. Changes in the levels and/or distribution of synaptic vesicle proteins may contribute to BDNF regulation of vesicle docking (Figure 12.3). In synaptosomes prepared from BDNF knockout mice, there was a selective reduction of synaptophysin as well as synaptobrevin, proteins involved in docking and fusion of the vesicles61. Treatment of slice cultures derived from neonatal hippocampus with BDNF increased the expression of several synaptic vesicle proteins including synaptobrevin63. Figure 12.3. Diverse Actions of Neurotrophins during Synaptogenesis. Activity-dependent release of neurotrophins promotes synaptogenesis by stimulating the maturation of pre- and postsynaptic cells and also by inducing profound morphological changes. © Presynaptically, neurotrophins enhance vesicle docking to the active site and also increase the expression of several key proteins involved in neurotransmitter release, including synaptobrevin, synaptophysin and synaptotagmin. 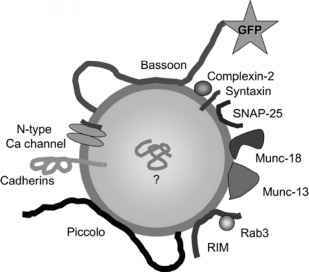 © In addition, neurotrophins elicit several postsynaptic effects that play an important role in synaptogenesis. 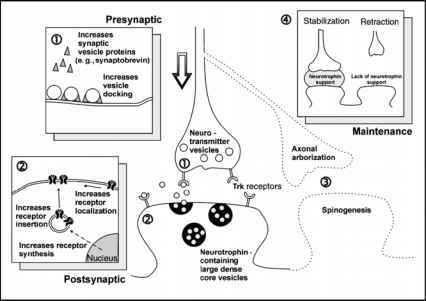 These include the enhancement of receptor synthesis, as well as the insertion and localization of various neurotransmitter receptors at synaptic sites. ® In terms of morphological alterations, neurotrophins enhance axonal arborization and spinogenesis of both excitatory and inhibitory neurons. ® Once new synapses are formed, neurotrophins stabilize these connections and prevent axonal retraction. It appears that the regulatory effects of neurotrophins are not limited to the hippocampus. In cerebellar slice cultures, BDNF or NT-4 promoted the development of inhibitory axosomatic synapses in Purkinje cells when neuronal activity was blocked, suggesting that neurotrophins underlie this activity-dependent form of regulation65. Conversely, blocking neurotrophins with antibodies greatly reduced synaptogenesis in inhibitory neurons66. 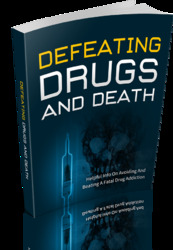 Further evidence comes from a study using conditional TrkB knockout mice. This study demonstrated that TrkB is required for the establishment of cerebellar inhibitory synapses67. BDNF can trigger PDZ protein expression at synaptic sites in developing cortical neurons70. Therefore, BDNF may promote the synaptic expression of AMPA receptor during development by facilitating the interaction between AMPA receptor and proteins involved in receptor trafficking such as NSF and PDZ proteins (SAP97, Grip, PICK1). A recent study demonstrated that TrkB-mediated signaling affects the number and synaptic localization of postsynaptic NMDA and GABAa receptor clusters71. In this study, BDNF treatment increased the number of receptor clusters and also the proportion of clusters apposed to presynaptic terminals. It should be pointed out that these results were obtained using cultured neurons and further work is necessary to confirm whether this holds true in vivo. In addition to receptor clustering, neurotrophins promote the formation of postsynaptic dendritic spines (Figure 12.3). Most excitatory synapses are localized to dendritic spines. In cerebellar cultures, BDNF, together with co-cultured granule cells, enhanced spinogenesis in Purkinje cells without affecting dendritic com-plexity75. Similarly, long-term treatment of hippocampal slice cultures with BDNF increases the spine density in apical dendrites of CA1 pyramidal neurons, without affecting dendritic length and branching64. A recent study suggests that BDNF regulation of spine formation in hippocampal neurons is controlled by cAMP, through two different mechanisms19. One is "cAMP gating," where cAMP promotes BDNF signaling by potentiating TrkB phosphorylation. In addition, cAMP facilitates translocation of TrkB into the postsynaptic density. Both mechanisms work together to mediate BDNF regulation of spine formation. Although these findings provide preliminary insights, the exact step(s) of synaptogenesis that are regulated by neurotrophins, and the mechanisms downstream of neurotrophin receptor activation, are not well understood. Further work is required to determine the necessity and sufficiency of neurotrophins at each particular step in synapse formation.